There’s been a lot of buzz surrounding the full array of impressive and innovative amenities at 5959 Yonge St Condos by Ghods Builders. With over 40,000 square feet of amenities including a bowling alley, zen river garden and a multi-purpose LED sports court — it’s no wonder why! 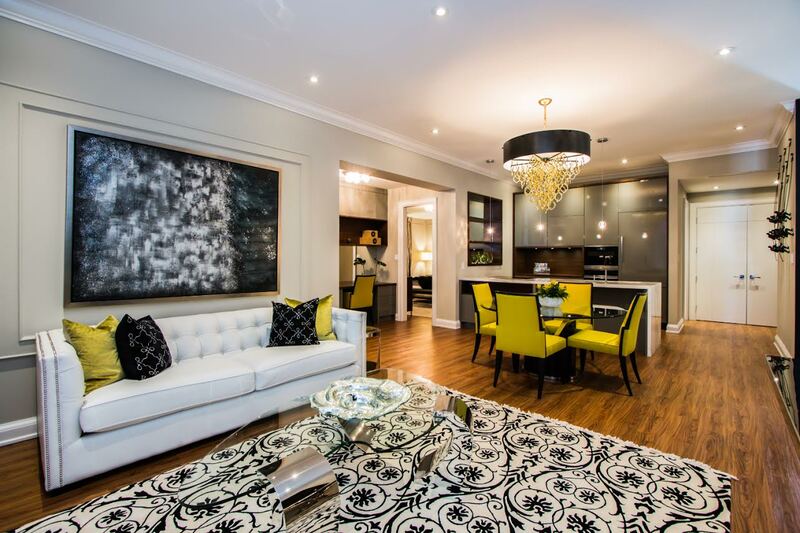 Now 5959 Yonge St Condos is showing off its brand new luxuriously appointed model suite. Designed and decorated by interior design team Leanne Tammaro and Adolphina Karachok of DesignTheory, the model suite features timeless, classic and modern design elements. “We designed the space to be contemporary and modern with a timeless, classic feeling by mixing a lot of materials and styles to create an upscale, custom look,” said Leanne Tammaro, Director at DesignTheory. Those high-end finishes include standard quartz kitchen countertops, six piece integrated European-style appliances, stacked washer and dryer and large 12 x 24 inch tiles in bathrooms. “Quartz countertops as a standard in the kitchen are a great feature because they are so durable and add such a luxurious finish, the counters can also be upgraded to granite,” said Tammaro. The design duo also maximized space in the kitchen by punching into the wall to create a clever art niche backed with mirrors which add visual depth. Overlooking the kitchen is the main living and dining area where a stunning chandelier hangs from the ceiling and is complemented by citrus-coloured sofa cushions and dining chairs. “The furniture incorporates mixed metals in golds and silvers which is a really hot and an on-point look right now,” said Tammaro. The gold and silver accents continue in the master bedroom where a gold-tone bench sits at the foot of the bed. The luxurious tufted headboard is flanked by two mirrored night tables, and elegant molding graces the wall providing an upscale classic look. The room is finished off by a silver accent mirror and rich, champagne coloured draperies. 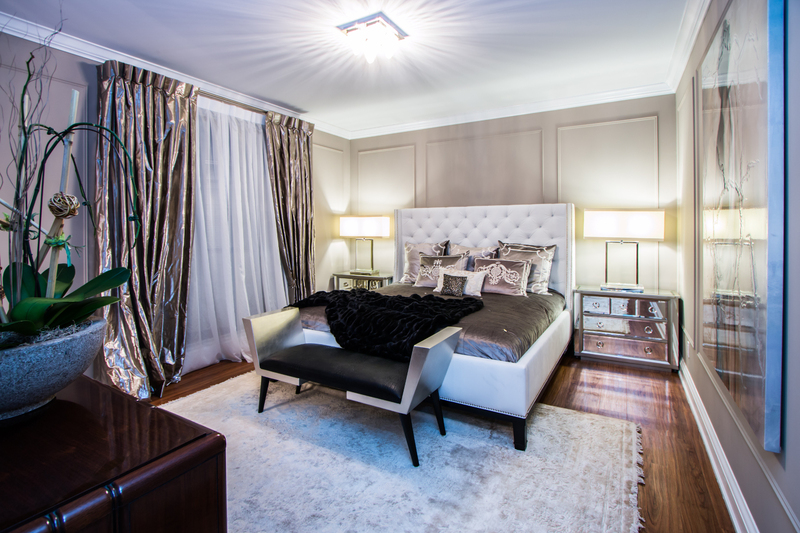 “We wanted this space to be more upscale and luxurious as you can see by the applied moldings on the walls and the use of luxe furniture pieces like the tufted headboard and the mirrored night tables which feel very glamorous,” said Adolphina. 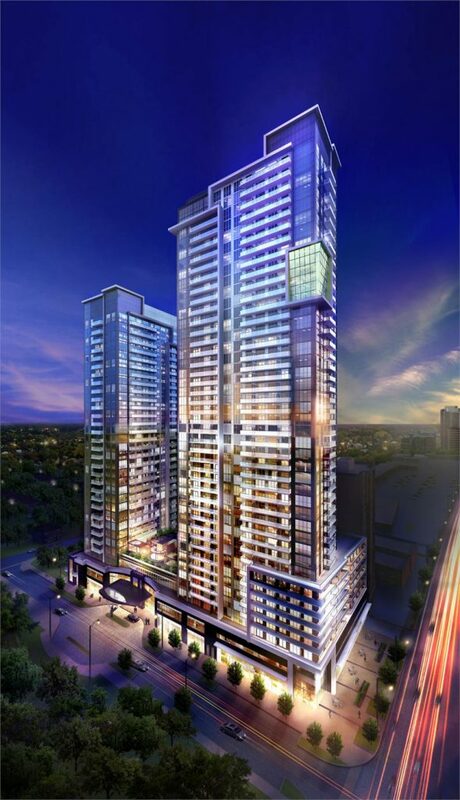 Suites at 5959 Yonge St Condos start from $288,900 and range in size from 510 square feet to 750 square feet. For more information, please call 416 229 9966 or register online to receive the latest news and information.